It seems a fluffy creature with light grey fur has been sleeping on/against the coat some day when I wasn’t there. And I can’t find the fur remover brush. Again, I’m waiting for Seb to help me there. I fear I’m a bit OCD when it comes to kitty fur on a garment. Especially one I’ve spent so much care and time over! Misses’/Miss Petite Coat or Jacket, Dress or Jumper, Slim Pants and Skirt. I made the jacket (view B), but it’s more of a coat to me. 6-22. I used sizes 6 and 8. I always need to use a size smaller for the back. I usually use a 10 for the bust, but it didn’t seem necessary here, given the coat’s amount of ease. Not much, given my alterations. What drew me to the pattern was the pleats feature, which you sew inside out as compared to regular pleats. I didn’t like the wide, wide sleeves… I mean, I actually do like them; I think all this fabric adds a nice touch of warmth and luxuriousness; but they would have looked ridiculous on poor small me. They would have overwhelmed my 5’1/2″ (154-cm) frame, and made me look like a little girl bundled up in a coat that is too big for her. I found the absence of lining a bit absurd, at least for a winter coat: see below. Shell: burgundy poly-wool blend, bought in the coating section of my favourite fabric store in Paris (chosen with dear Tany, and therefore a treasure!). 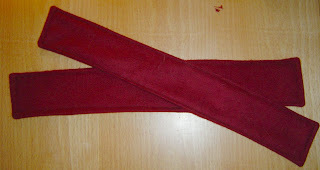 – I lengthened the sleeves by 6 cm (about 2 1/2″). – Given my short size, I shoud have “petited” (shortened) the pattern; the pattern even had lines to do it; but I prefered a longer jacket, since this is more a coat than a jacket for me. – Since I liked the width of the sleeves but not the figure it created, I decided to keep the width, but cinch the sleeves with belts. This was suggested in the Fall issue of the Sew Stylish magazine. – I lined the coat entirely. I documented the whole process here. I certainly hope to make something from the rest of this wardrobe pattern. There are lots of opportunities with this pattern. I would definitely recommend it; the pattern is well drafted, the explanations very clear, and SewStylish magazine demonstrates how easy it is to take the pattern as a sheer base and alter it to make it fully yours. The colour is very true to life here: a deep, ever so slightly pinkish burgundy. I love wearing this kind of deep red with a cold tinge. Red looks good against my hair, but since I have a cold (pink, not peachy) colouring, anything with yellow/orange undertones will look terrible against my skin; whereas purply/pinkish reds are great. I thought this would add a nice touch of colour among my black and white autumn/winter 07/08 wardrobe. I believe this is one of my best sewing achievements so far. 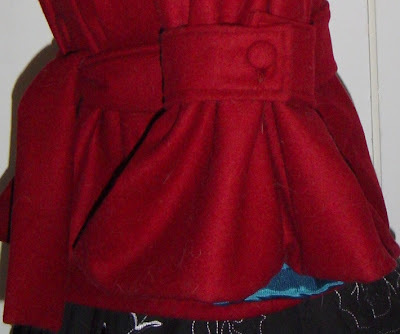 I learned lots while making this coat, went the extra mile to make it special (adding a pretty lining, handstitching the hem and collar band, etc); and I shall wear it with pride! 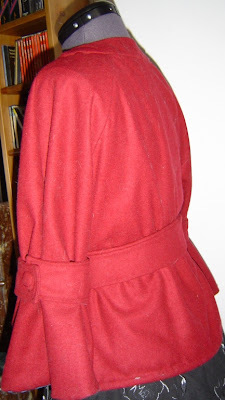 I had made a plum coat last year, but it was unlined (it was thick boiled wool); it’s pretty, and doesn’t have any technical faults that I’m aware of; however, comparing my two coats today, I can see how much I have learned over the past year. I feel that every progress I make with my sewing draws me closer to my Grandma. This is greatly thanks to many of you wonderful seamstresses who are so generous with your talent and inspiration. Thank you!! Back to gift sewing! 🙂 Have a great day/evening, everybody. I Love your version of this!!! I love how you made it your “own” Looks fantastic! Oh how absolutely lovely it is. You are so talented. I have a similar style jacket not red but this one beats it and I bet it cost you not even half the price what they sell in shops. Oh Isabelle it really looks beautiful and chic. Well done my friend. Isabelle – ((((hugs))))Thanks so much for posting pictures of the jacket for me! I have just stolen some minutes from work to look at them and read your wonderful review!I absolutely LOVE the sleeve treatment! Gurl, that is so kewl! 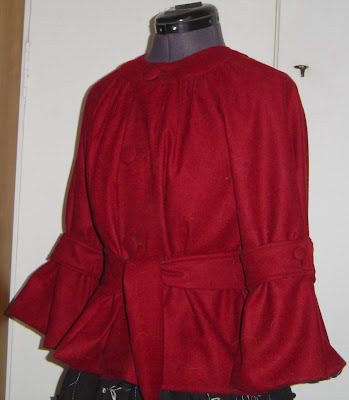 And I remember it now from the Sew Stylish magazine…what a great adaptation!You should be proud of your sewing achievements because this is a fabulous jacket! Wear it with much pride and thanks again for the review! Isabelle, WOW! What a great job you have done. I love the turquoise lining – such fun. I like how you have made the pattern your own, unique to you.Congratulations for coming such a long way over the past year. Though your skills were pretty good a year ago. 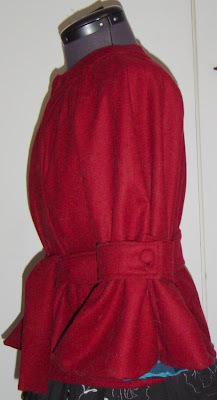 I had a look at your burgundy coat from Nov 06 and that is a fabulous creation as well. Umm…I absolutely LOVE the sleeve belts! What a creative twist to this pattern. Great job on the lining too. Hello my dear !What a beautiful jacket, and what a good job you did with it !Have a good evening ! Oh, it’s lovely!! !I bet you look spiffy in it! Isabelle, a WOW from me too. 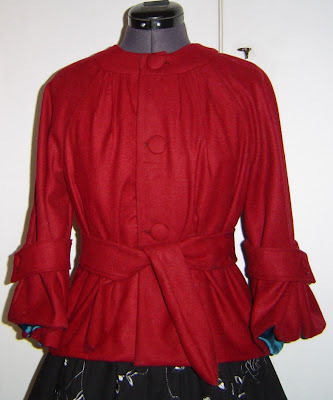 It’s a wonderful jacket and I especially like the sleeves and the different color of the lining. So special!Thanks for posting the pictures now, and soon we’ll see you in your coat (if it’s not freezing too hard with you in Paris, here in the Netherlands it’s getting very cold, but of course you know that already :-). It is utterly captivating. Once Seb is home, I really hope you’ll have him photograph you in this so you can share the pictures!! Oh Isabelle, what a masterpiece! You have every reason to be very proud of your work! See, you’ve picked a pattern and some fabric, made all the important decisions along the process and created beauty! All the details you’ve added to the original model make this garment a very special and unique! I love the sleeves and the contrasting lining! The jacket looks luxurious and I’m looking forward to seeing you modeling this beauty! MANY MANY kisses&hugs and congratulations on this great achievement! Gorgeous jacket. I love how you tamed the sleeves. What an ingenious idea. Mmm, gorgeous! What a smart yet snuggly looking coat. Wonderful colour. I bet it looks great on you. Can’t wait to see a photo of you modeling it … I will wait of course lol. Wouldn’t want you hobbling around and making your foot worse. The coat is gorgeous, and the color combination is beautiful and so unique, you certainly won’t find that in the shops. It does feel good when you learn so much from a project. Wear this proudly! I think I would wear this coat everyday for the rest of my life if it were mine. I really love it that much.Your such a wonderful seamstress.I loved last years coat too. Very pretty! This looks wonderful and I love what you did with the sleeves. I have this pattern (bought it for the dress) and have never been inspired to make the jacket. Hmmm… I may have to change that. Great job! Beautiful coat! The sleeve bands are such a nice touch – can’t wait to see you wearing it! Fabulous Garment and the color is stunning. Félicitations Isabelle ! Toujours de très belles réalisations à admirer sur ton blog . Noël approche et je ne voulais pas laisser passer ce moment sans te souhaiter d’excellentes fêtes de fin d’année . Amicalement . Congratulations Isabelle! It’s all so very well thought of and beautiful fabrics indeed and of course exquisite finishing ;-). Ann. Oh Isabelle! It’s so beautiful! It is really just stunning! I love the turquoise lining, the sleeve belts, the fabric, the color, the drape . . . ! You did an amazing job on it! I’ve followed your sewing skills as you’ve progressed since you first started blogging. You have progressed so much in your approach to your projects. I’m continually impressed by the way you adjust projects to suit your requirements and to broaden your skills! Hurray! Congratulations! Gorgeous, Isabelle! You do beautiful work. Oh, it’s gorgeous! The color of the coat and the lining are just magnificent together. You really are a master seamstress! this coat is brilliant and the color combination to die for. I loooove what you did with the sleeves. I’m so glad I’ve got that edition of Sew Stylish! You did an amazing job! Beautiful coat. I love the sleeve details and lining. Hope you will get lots of wear from it. You are truly sewing “couture” garments. Absolutely gorgeous! I love what you did with the sleeves. I have the pattern and the fabric AND the issue of Sew Stylish. I might have to try that variation with the sleeves. I won’t brave the lining though. You did an amazing job! Wow Isabelle – what a fabulous creation. You are so talented!!!! Isabelle, this is a really fabulous jacket! So feminine and classic…but with the bit of a surprise lining. And, of course, beautifully sewn. Kudos!